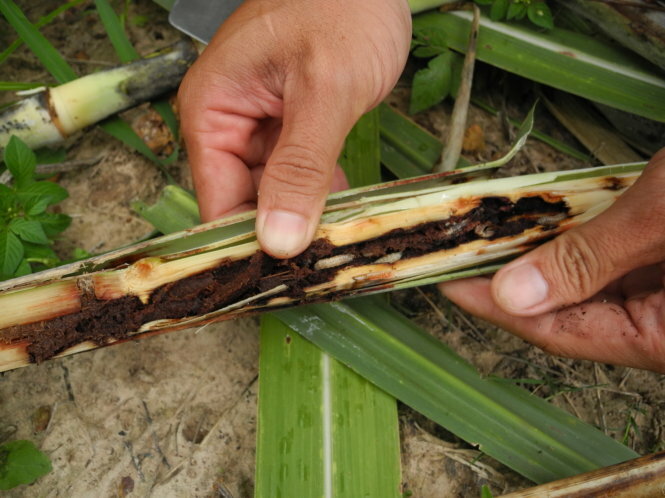 HCM CITY (VNS) — A species of sugarcane stem borer that has appeared for the first time in Viet Nam has damaged large tracts of sugarcane in the south-eastern province of Tay Ninh and is likely to spread further. The new borer (Chilo tumidicostalis Hampson), which has four stripes and a brown head, multiplies rapidly to up to 100 larvae to a sugarcane, according to the Sugarcane Research Institute. Sometimes the plant is killed, especially young ones. The insect, which has a life span of around 50 days, has plagued other countries like Thailand for a long time, the institute said. First noticed in Tay Ninh in June, it infests mostly the top three joints of a sugarcane. The province's worst affected areas are in Chau Thanh, Tan Chau, Duong Minh Chau, Tan Bien, Ben Cau and Hoa Thanh districts, and Tay Ninh city. Chau Thanh is worst hit, with about 3,600ha out of its 5,900ha of sugarcane affected, according to the district Agriculture and Rural Development Bureau. Pham Dinh Gian, deputy head of the bureau, said the figure was based on sugarcane with withered and yellow tops, and the actual figure could be higher since the tops look green in the early days of infestation. Vuong Quoc Thoi, deputy director of the Tay Ninh Department of Agriculture and Rural Development, said the stem borer had infested more than 5,000ha out of the province's 21,000ha of sugarcane. The department was instructing farmers in measures to combat the pest, including spraying of pesticides, he said. He has called on local sugar mills to buy sugarcane earlier than scheduled. The harvest was to have begun in November. Ho Van Chien, director of the Southern Plant Protection Centre, said the central Plant Protection Department had ordered the Tay Ninh Department of Agriculture and Rural Development to announce the pest outbreak.